As I mention frequently on here, platformers need a gimmick or a sort of universal selling point. The platforming core remains fairly consistent, but there needs to be a – no pun intended – game changer. In the case of INK, the game changer is the color mechanic. Essentially, you don’t really ‘see’ the level, and you need to cover surfaces in the paint to be able to see them. This means that when you start, you’re not really sure what to do. You see the little square you control, and you see the rainbow-colored door you need to get to. At that stage, it’s up to you to work out how to get from A to B. As you move along any surface, you leave a trail of paint (at least, I really hope it’s paint) that helps you work out what the structure of the level is. It means you have to be careful and work out the structure of the level gradually rather than jumping forward bravely. You kinda get a sense of the level structure piece by piece, as every object becomes covered in paint and you figure out where to go next. It’s a style of gameplay that demands concentration and quick thinking. Now the game is broken up into levels in fairly typical arcade style, meaning each level is a contained entity and you need to determine its ins and outs. It also means the game is fairly simple on the whole. Once you figure out a level’s structure, you just need to make it to the end of the level and then you’re golden. The problems with INK come in two specific spots. The first is that, at its core, it demands trial and error gameplay. There’s no real alternative than just hopping along, maybe dying, and repeating the process. At some point, I realized that when you hit jump a second time, you actually spray ink everywhere, so that makes things a bit more simple. But by and large, it’s good ol’ fashioned trial and error that helps you navigate the game’s short levels. The second issue is that the game’s platforming physics can be a bit wonky. It doesn’t feel as smooth as it should to bounce around, and in a game where double jumping and wall-jumping are key, you need to have a smoother engine in place to make sure the hopping flows more. Aside from that I’d say my biggest beef with INK is that it doesn’t really do that much of interest with its gimmick; in fact, I don’t know that it can do that much with its gimmick. INK is fairly short and doesn’t have much on offer beyond the basic ‘cover things in paint’ concept. There are some more mechanics that get added further down the line like enemies that you can jump on Bowser-style, but it doesn’t really go anywhere from there. 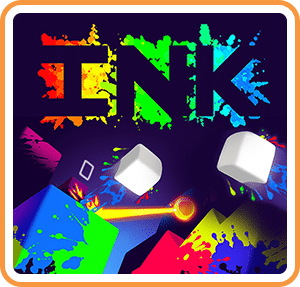 INK was reviewed using a Nintendo Switch digital download code of the game provided by Digerati. The game is also available on PlayStation 4 and Xbox One via digital store releases. We don’t discuss review scores with publishers or developers prior to the review being published (click here for more information about our review policy). INK is a decent little platformer that has a fun concept at the start but doesn’t really do enough with it. It’s good for a few little bursts, but more serious aficionados of the platforming genre won’t enjoy it as much.